Speakers don't have to be something you hide away. 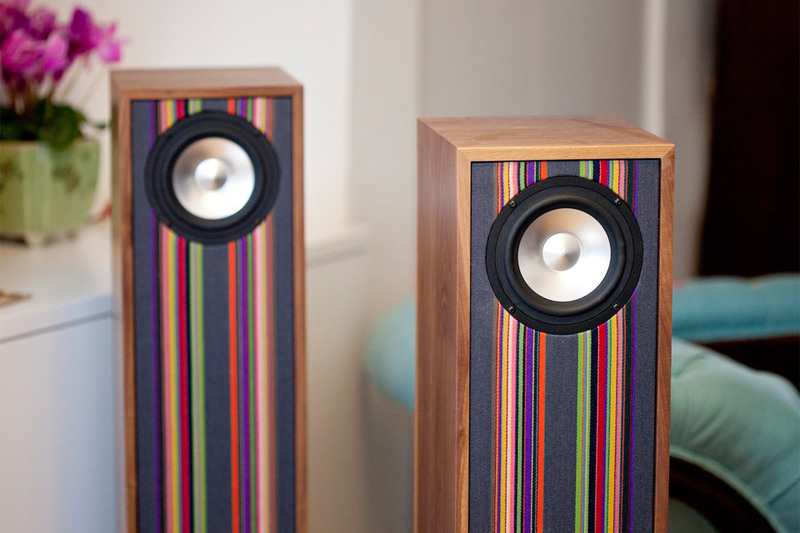 These Tailor Loudspeakers (£2,000; roughly $3,000) are designed to displayed proudly. Standing just a hair over three feet tall, these handsome speakers are built from English Walnut, and feature a balanced, natural sound with fast bass and a frequency response of 40Hz ~ 20Khz. 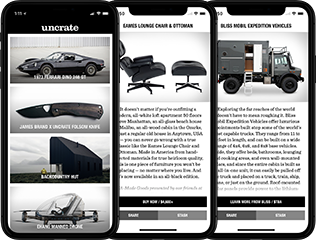 But what really sets them apart is the front, which is upholstered in fabrics from Maharam suppliers to Paul Smith, giving them a unique look that you'll want to make part of your living area. Should looks not be of importance to you, you can still grab a pair with a plain black front for a few hundred pounds less. Have an unused speaker laying around? Put it back to good use with The Vamp (£35; roughly $55). This diminutive cube-shaped box gives your aging gear new life by providing a Bluetooth link to your phone or tablet and a 4 Watt single-channel amplifier that can drive even large speakers with surprising gusto. The whole thing is powered by a rechargeable battery that lasts for over ten hours, and can connect with speakers that boast on-board terminals or a plain ol' wire coming out the back. Shipping in June in white, red, or black. Why choose between a wireless speaker or a docking system? With the Bowers & Wilkins Z2 AirPlay Speaker System ($400), you don't have to. A fresh take on the Zeppelin Mini, the Z2 features a top-mounted Lighting dock that fits iPhones and iPods, as well as built-in Wi-Fi for AirPlay support. Other features include class D amplifiers, custom 3.5-inch drivers with fiberglass cones, a glass-reinforced ABS enclosure, a 3.5mm auxiliary input, and your choice of black or white bodies. No, it doesn't hold liquids — but it will fit in your bicycle water bottle cage. The Scosche BoomBottle ($150) is a compact weatherproof speaker that aims to make better use of your cup holders. It features two 40mm drivers and a passive subwoofer to produce surprisingly rich sound, Bluetooth for wireless audio streaming, a 3.5mm input for other audio sources, a built-in microphone for speakerphone use, integrated music controls, and a rechargeable battery that lasts up to 10 hours. Available in five different colorways. You don't need to be rocking a rustic look in your home for the Audiowood Barky Turntable ($1,300) to fit in with your decor — but it surely wouldn't hurt. This precision piece of equipment is made from a Rega parts kit, featuring a glass platter, a RB303 arm, a Rega Bias cartridge, and a solid ash platform that's finished with polyurethane, wax, and boasts adjustable spike feet. A decent vinyl collection for it to play? That's up to you. Improve the sound coming from your TV and give yourself a wireless audio solution all at once with the Sonos Playbar ($700). Designed to complement most HDTVs, this single-box solution features nine individually amplified speakers — six mid-woofers and three tweeters — and a single optical input that lets you switch between sources using your current TV remote. Of course, this is a Sonos box, and as such offers built-in support for wireless audio streaming, as well as compatibility with the Sonos Sub and Play:3 speakers, which let the Playbar form a 5.1 surround system. Shipping in March. It's not exactly water proof — you'd do well to avoid throwing it in the river — but the Braven BRV-1 All-Weather Speaker ($180) is IPX5 water resistant, making it an ideal speaker to use poolside, by the campfire, or anywhere else outdoors. Apart from its rugged build, it also features 3W of output per channel, a built-in rechargeable battery good for up to 12 hours of playtime, Bluetooth for wireless audio streaming, a 3.5 mm auxiliary input, and a mic for speakerphone use. Available later this month in teal and a handsome black and gray.